Last year, fellow poet Sean Howard and I created a poetry installation, called “Poemtree” for Lumière Cape Breton. This year, we have been invited to bring the Poemtree to Halifax for Nocturne, in an exchange between the two festivals. We’ll be adding poems to a beautiful weeping willow on the waterfront near the bottom of Salter St. from 6pm to 11:59pm, on October 13th. Come visit the Poemtree! Bring a poem or choose one on the spot. I had a great time debuting Ruba’iyat for the Time of Apricots at the Winnipeg International Writers Festival. I had the opportunity to read in Brandon and Winnipeg, see old friends and colleagues, meet new writers, and hear some dazzling, funny, visionary poetry at Voices in the Circle. I’ll be launching my new poetry collection with poet Sean Howard at the Writers’ Federation of Nova Scotia, 1113 Marginal Road, Halifax, on Friday, October 12, from 7:00-8:30 p.m. Everyone is warmly invited to join us for short readings from the new works, discussion, and light refreshments. A new book of poetry! I’m happy to be part of the 2018 Poetry Quartet from Frontenac House Press. Check out the book, and the Quartet, here. Or, buy yourself some poetry here. My chapbook manuscript Ahli was shortlisted in the New York Center for Book Arts Chapbook Contest. I’m VERY excited to be reading with David Denny, and Kimberly Kruge at the Center on October 20th, at 6:30pm.The Center will be producing a broadside from a selection of my work that will be available at the reading. I can’t wait to finally have a look at the Center’s studios and gallery….and, you know, NEW YORK. I had the good fortune to participate in Lumière Cape Breton’s Art-at-Night event in downtown Sydney on September 23. Fellow poet Sean Howard and I collaborated on an installation called the Poemtree. 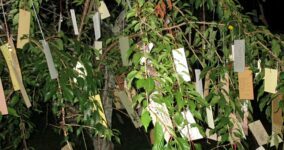 Participants were invited to bring or write poems to hang in the tree’s branches over the course of the evening. People brought and wrote hundreds of poems–silly poems, sacred poems, secret poems, love poems, heroic poems, you name it. It was magical! My essay “Bone Shadows” made the longlist for the 2017 CBC Nonfiction Prize. I’m as surprised as you are. This is good news for the rest of the embryonic essays slowly taking shape in my mind. I was pleased to learn that my long poem Ahli was shortlisted in the emerging writer category of this year’s Gwendolyn MacEwen Poetry Competition, administered by Exile Literary Quarterly. Expect to see a selection from the poem in the near future. I’ll be on the road with Niche in April, with stops in Sydney, Lunenburg, and Ottawa. My thanks to the Cape Breton Regional Library, CBU’s Department of Languages and Letters, Lexicon Books, and the Tree Reading Series. Hope to see you!